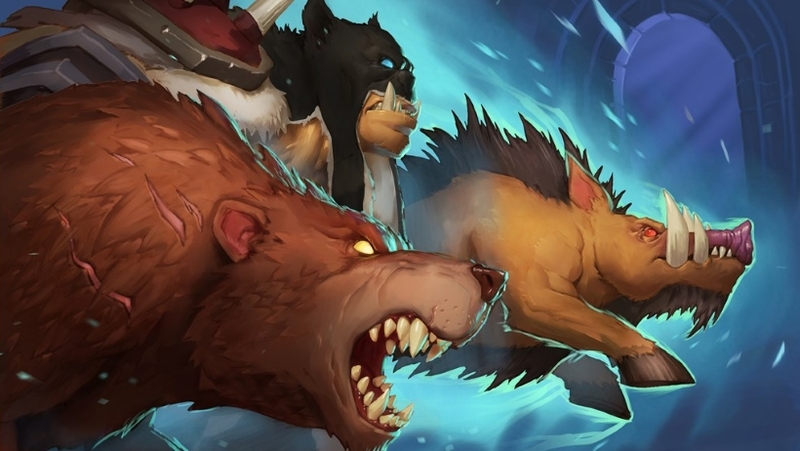 Our Spell Hunter deck list guide features the best Rastakhan deck list for Season 61 of Hearthstone (April 2019). Our Spell Hunter guide also contains Mulligan advice, card combos and strategy tips. Spell Hunter is a Hearthstone deck that was quite a surprising concept when it first debuted in the Kobolds and Catacombs expansion. Was a class known for its powerful Beasts about to give them up in favour of a deck made entirely of spells? How exactly would that work? The results we actually quite good! Since then, it has seen a lot of play over the last year and found itself in a healthy spot in the meta for some time. That said, with the recent set rotation, it’s losing a number of the tools that made it so effective and so a more significant do-over is required. It’ll be interesting to see just how viable the deck remains with the launch of the Rise of Shadows expansion now it has undergone such drastic changes. In the latest version of our Spell Hunter guide, we’re highlighting the best version of the deck for the new meta. We also have more specific advice on how to play Spell Hunter across this page, including Mulligan tips, combo details and strategy information. Here is the version of Spell Hunter seeing the most play right now on the Hearthstone ranked ladder. It’s finding some success, but hasn’t broken into the top tier. Forget most of what you knew about Spell Hunter over last few months - it’s time for a change. While some of the general strategy around the deck remains the same, the loss of Rhok'delar means you no longer have to be as strict with deck building in order to make Spell Hunter work. Instead, the aim of this version is to orchestrate a situation where you can burst down your opponent by sending a lot of cheap damage spells to their life total after enabling many Spell Damage effects. Early game: Contest the board with Secrets generated from Secret Plan and the minions you summon from Animal Companion. The aim is to maintain control where you can, but avoid using your cheap damage spells as removal as these play a large part of your win condition in the late game. You can fall behind a little, just don’t get overwhelmed. Mid game: Continue with the control approach by removing enemy threats from the board using your minion-targeting spells and weapons. Try to remain in control of the board with cards like Animal Companion and Baited Arrow – the latter is brilliant if you can trigger the Overkill effect to get a 5 / 5 Devilsaur on the board. Unleash the Hounds is great to catch up against a wide board, while Master's Call can be used to help you dig for a key combo piece for the late game if you’re missing it. Late game: Here’s where you bring your win condition into full effect. Start with Jepetto Joybuzz and with perfect luck you should hit both Malygos and Vereesa Windrunner. If you whiff on the latter it’s not too much of a disaster – Malygos is the key target here. The very next turn you can then unleash your barrage of burst damage. Drop Malygos and go for your opponent’s life total with all those damage spells you have. As an addition to this, if you have the extra Spell Damage from Thori'dal, the Stars' Fury that’ll make it a little easier to blast your opponent away for good. Or you can fire off all those damage spells and then repeat them the very next turn with Zul'Jin, although with random targeting you may fall foul to your own game plan, so be careful! Here are five or so tips for dealing with aggro opponents on the ladder. 1. It’s always worth keeping Unleash the Hounds in your opening hand as well as a minion damaging spell or two. You don’t want to let aggro run away with the match in the opening turns. 2. As much as you don’t want to use your low-cost damage spells on minions, it may be necessary in some cases to stay in the game. 3. With many of the lower health minions in aggro decks it should be easier for you to trigger the Overkill effect on Baited Arrow. That 5 / 5 Devilsaur can present a huge problem for aggro. 4. Any spare mana you have can be used to weave in a hero power to chip away at your opponent’s Health. 1. Arcane Shot, Rapid Fire and Kill Command all offer a surprising amount of burst damage to finish off a control deck when they least expect it, especially when buffed with Spell Damage. 2. Without Hunter’s Mark you might struggle to deal with particularly healthy minions, though Unleash the Beast, Spell Damage buffs and Discover effects can help here. 3. We would advise you to never play Malygos without using the Spell Damage bonus on the same turn in some way. Control decks can easily remove the card the very next turn and leave you seeing no value from it. 1. Animal Companion: You’ll want to keep this so you can get a body on the board early to contest your opponent's minions. 2. Secret Plan: One way to disrupt your opponent’s opening turns is to stall them with Secrets. 3. Jepetto Joybuzz: As it’s such an important part of your win condition you’ll want to hold onto this if you find it in your opening hand. 4. Master's Call: Another way to draw the combo pieces you need in order to set up your explosive win condition. 5. Marked Shot: Not a bad hold as it can be used to remove some early minions while granting you a bonus spell. - You won’t get the full effect of Master's Call as the deck runs no Beasts, but this is a great way to Discover a copy of Jepetto Joybuzz from you deck and make your win condition more consistent. - Kill Command only does three points of damage in its vanilla form. If you can get any kind of Beast presence out in play, however, the damage output of this spell increases to five points - this can be a real game-changer, whether for controlling the board or finishing the fight off more quickly. - Baited Arrow can deal three damage to a minion but you’ll want to try and hit something on two health or less so you activate the Overkill effect and spawn a 5 / 5 Devilsaur on your side of the board. - Once you’ve played many of your spells, you can then cast them all again by playing Zul'jin. This reckless hero card will repeat each one – with randomly chosen targets where necessary – so you can get some huge value off it with more copies of Unleash the Beast, Marked Shot and Baited Arrow. - Malygos increases the damage of all of your spells by five. That represents some serious extra punch on spells such as Kill Command, Arcane Shot and Rapid Fire at their low mana costs. - Alexstrasza can have a huge impact on the game by dropping your opponent’s Health all the way down to 15. If you follow this up with Malygos and a few damage spells they’ll be defeated in the blink of an eye. - There seems to be a huge downside on Jepetto Joybuzz, but if it draws cards such as Vereesa Windrunner, Alexstrasza and Malygos you won’t be too sad as you play those cards for their effects over their stats! Arcane Shot: Fairly innocuous spell that then flies out of control if Malygos is on the board to represent some significant burst damage. Rapid Fire: Serves exactly the same role as Arcane Shot in the deck by offering some more burst damage for your finisher with Malygos. Kill Command: We may be repeating ourselves once again, but this spell is another to add to the list of finishing moves while Malygos is on the board. Master’s Call: This spell ensures you can dig for a copy of Jepetto Joybuzz from your deck and set up your finishing combo. Vereesa Windrunner: Rewards you with a decent weapon that can buff your Spell Damage even further. Not a vital part of the combo but handy to have nonetheless. Jepetto Joybuzz: Allows you to draw Malygos from your deck and set its cost to one mana. It’ll nerf the card’s stats too but you’re playing it for the Spell Damage bonus anyway. Alexstrasza: Can make finishing off your opponent a little easier if you drop them all the way down to 15 Health before unleashing your barrage of spells. Malygos: Gives you the massive Spell Damage boost that the deck needs to burst down your opponent with all your cheap spells. Zul’jin: Serves as a backup finisher should you need it. Definitely the more risky and inconsistent option, though, so you should always aim for Malygos first. @FakeHearth Hi there, thanks for letting me know about this, I fixed the code at the weekend but only had a chance know to let you know! I've also checked all other Deck IDs on the site, and it looks like a one-off - sorry for the annoyance factor here anyway. @Soxaldinho You are quite right, and thanks for the clarification. James and I both had a shared misunderstanding over this and I've tweaked the article. Here's the pre-Boomsday deck and ID if you're still playing this one ahead of launch! 2 x To My Side! @R8mulus Also, sorry for the delay in replying! I'm just catching up on everything now after the Christmas holidays. Hi@R8mulus. We'll see what the meta looks like then, but I would probably be inclined to put another Explosive Shot in assuming nothing else comes along in the next rotation. @fanap That was a bit inconsiderate of me actually, sorry! I've dug the previous version out of the archives just in case you want to revert to it.